I really enjoy small things in life than grandeur and bling. Maybe not but in this case, I refer back to the tech expo thingy that I help put together. Sharecase is a one day conference with 1,000 people, 50 exhibition booths, 20 presentations, and 100 volunteers. This event is a great accomplishment and the joys of being part of it would knock the socks off of anyone. However, after all that was said and done, the one thing that I remember was the gift I received from our event planning company. 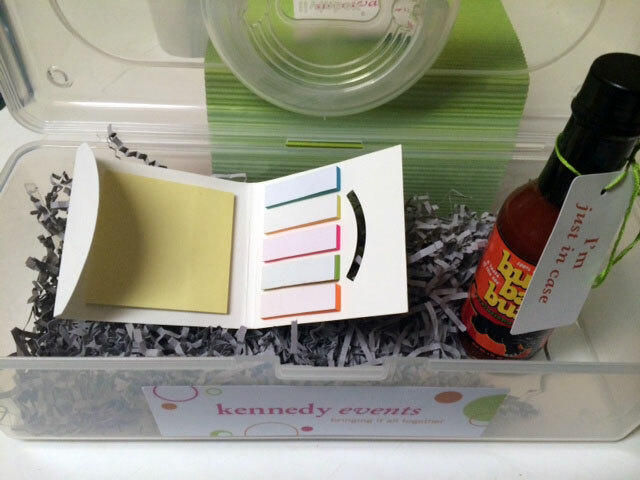 Kennedy Events produces and manages events for companies and nonprofits throughout the Bay Area. From conferences to product launches, fundraisers to award ceremonies, they deliver events that build community. With over twenty years experience and a proven team of professionals, they solve problems you didn’t even know you had. They definitely know how to deliver events that build community. Now back to the gift. 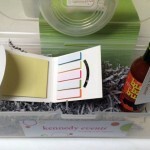 Kennedy Events gave two other co-chairs and me an Event Survival Kit. I previously saw them before they gave it to us but I thought it was part of what they bring to events…just like what I would bring to events: duct tape, scissors, pocket knife, and towel. Most of you already know how much I love kits. 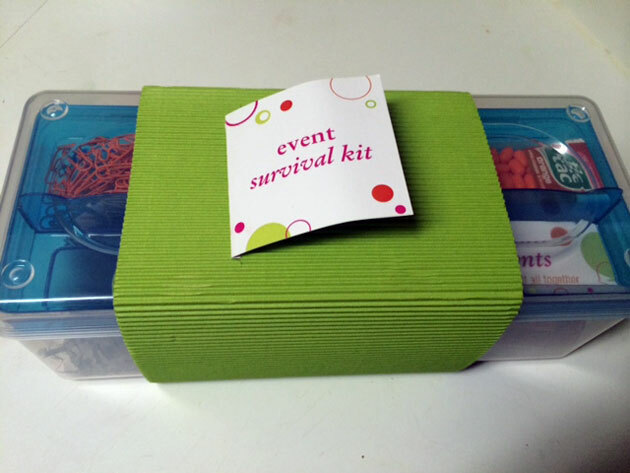 So what’s in this Event Survival Kit? Paper clips, binder clips, tic tacs, energy bar, permanent marker, colored Post-its, and hot sauce. What’s even better is that I really feel like this kit was made just for me…well, it was made just for me. 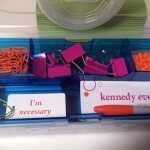 One of my favorite colors is orange and the paper clips, tic tacs, and permanent marker are orange. 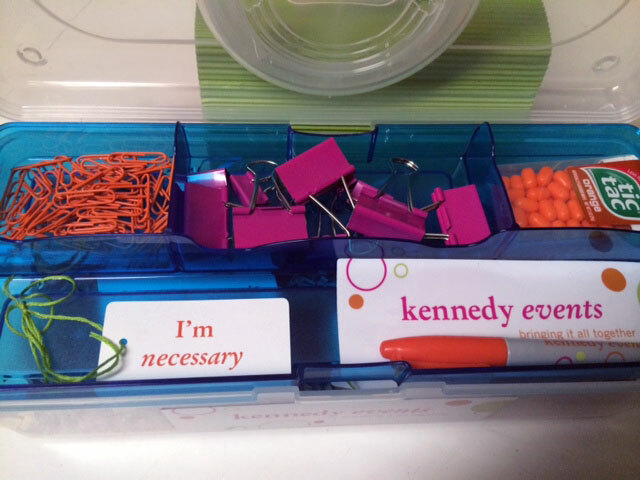 It would be cool if the binder clips were orange but I’m good with them being in pink. This is how I know Kennedy Events pays attention to detail. I know other planning companies that think they pay attention to detail but I’ve never seen it at this level. In my survival kit, as I mentioned above, I had hot sauce, the other two did not. Our rep from Kennedy Events remembered seeing my hot sauce collection and then included one of my favorite bottles inside my kit. They gave the other two significant things that mean something to them. There’s attention to detail in terms of customer service. I care more about the attention to detail at the human level. I’m definitely going to use this survival kit in the future. I have another event in December where I know this will definitely be used. I just wish I could bring Kennedy Events to help me run the show.